Sister restaurant to the long established Zara’s Kitchen in Croydon, this is a family owned and run, unique restaurant. 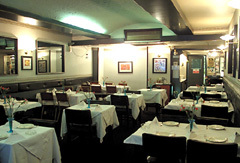 The menu features authentic Indian and Kenyan style cuisine prepared to old family recipes. The popularity of the dining experience is evidenced by the number of repeat diners. Bring your own alcoholic drinks and there is no corkage charge. This certainly ensures quality eating at extremely low cost and this is the reason for their motto “the only place where good food costs less”. Open every evening 6-midnight and Sunday lunch 12-4pm. All major credit cards accepted (not Amex/Diners). No service charge. Authentic Indian and Kenyan style cuisine. Bring your own alcoholic drinks - no corkage.